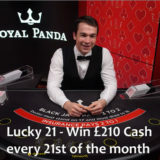 On the 21st of every month you can win £210 Cash if you get a Blackjack while playing at the Royal Panda Live Blackjack tables. They have a few dedicated Live Blackjack Tables, you can read more about them in my Royal Panda Live Casino review and video. 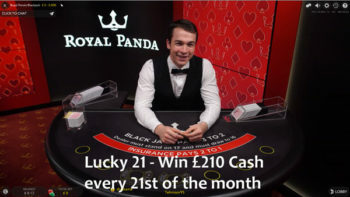 So all you’ve got to do is play on the dedicated Live Blackjack or Live Blackjack VIP tables on the 21st of the month. 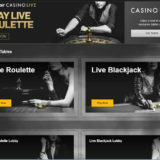 Get a Blackjack while playing. 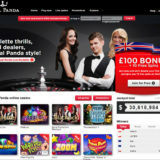 Your name will be entered into a draw and 3 lucky players will win £210 each. The prize winners will be announced the following day on their facebook page. 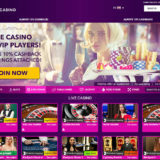 There are no wagering requirements on the prize. 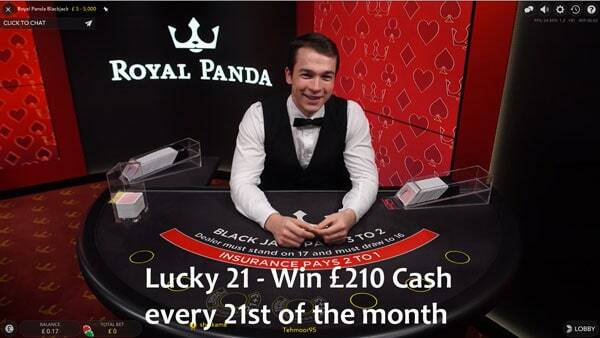 The cash will be deposited to your account by midday on the 22nd.